Maybe you adopted a new cat to give your current cat a playmate. Or you brought home a kitten to encourage your two older cats to exercise more. But now they won’t have anything to do with each other. In other cases, cats in your multi-cat home may break into “cliques,” essentially ostracizing — or even fighting with — other cats. What’s a peace-seeking owner to do? When you adopt siblings that have been raised together since birth, there’s a pretty good chance they’ll get along later in life. Same goes for kittens that were introduced at a young age. But mixing adult cats in one household can be more problematic for a number of reasons. Introducing a new cat abruptly, rather than gradually, can upset the current household cats. And any cat that was poorly socialized as a kitten may not have the skills to interact properly, which can put other cats on the offense. Not having enough resources — litterboxes, food and water bowls or cat trees — or limiting the access to those things can make some cats territorial about these items. For litterboxes, the general rule of thumb is one box per cat, plus one. So, if you have four cats, you need at least five litterboxes in different locations. Cats of different ages may have different energy levels. 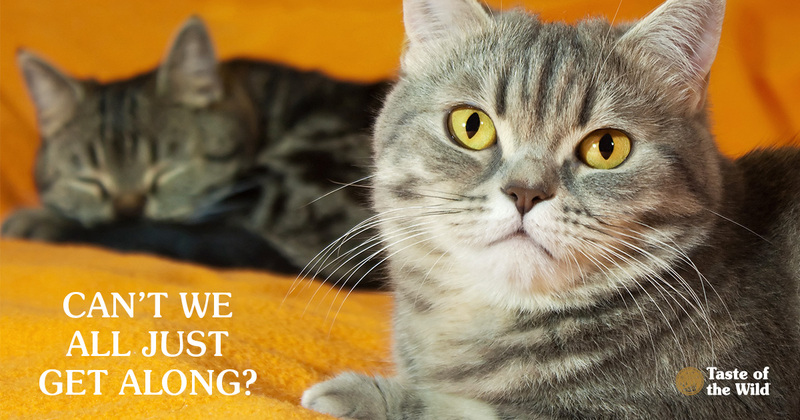 An older cat may lose patience with a younger cat that’s constantly interrupting naptime or pouncing on painful, arthritic joints. Aggression between cats may be overt, with threatening body language including hissing, arching the back, raising the hair along the spine and tail, presenting the side of the body, or turning ears back. The situation can also escalate into an all-out brawl. An indoor cat watching a neighborhood cat “trespass” in the yard may displace its frustration by attacking the unsuspecting cat sitting next to him or her. There can also be more subtle forms of feline aggression. The “bully” may stare at another cat in an intimidating manner. He or she may block access to the litterbox, scratching posts or cat trees. The aggressor may push the other cat off the couch or away from your attentions. Unresolved inter-cat aggression can lead to chronic stress and other problems such as house soiling, marking and over-grooming. What can you do to help make things happier on the home front? 2. Eliminate the “vet” scent. When one cat visits the veterinarian, rub a towel on that cat, then on your other cats, then back to that cat again, before letting that cat back in the household. That way, you can eliminate the strange scent that may put other cats on edge. 3. Don’t skimp on the resources. Make sure there are plenty of litterboxes, scratching posts and toys to go around. Provide places to hide and cat trees with high resting spaces. It may be best to avoid covered litter boxes because cats may feel vulnerable with only one entrance and exit. 4. Neuter male cats. While this can help reduce aggression, it may not completely eliminate it. 5. Provide places to hide. For cats that get bullied by other housemates, provide a room where it can get away from others. You could even set up microchip-operated cat flaps inside the home that only let certain cats in or out of an area. 6. Consult your veterinarian. In some cases, medications, pheromones or a consultation with a veterinary behaviorist might be necessary to help lower stress in the house. Your cats may never be best pals. But you can help them call a ceasefire.